Small business promotional package for indoor or outdoor events. Get top of the line promotional materials for your next outdoor event or business promotion. Perfect for events at the BIC, Hampshire County Fair, cycle or racing events, or one of the many local festivals. 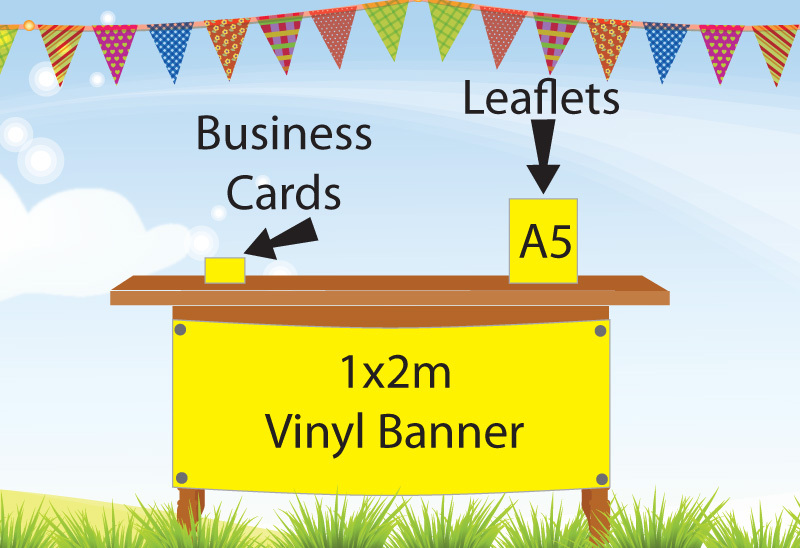 Beautiful custom promotional banners, leaflets, and business cards will attract customers to your location and promote your business or organization. Save money when you bundle promotional items for your small business in our Small Show Pack. Completely customised promotional merchandise, printed to your specifications. Just upload your graphics for fastest service and quick delivery. Assistance with graphic design is available for an additional cost. Please see our How To Order tab for more information on ordering your promotional materials package.